A couple of weeks back I posted the poll “More or less, what should I blog about?”. Though I put it in the form of a question I did it to confirm a hunch I had. I will occasionally post recipes here at www.glutenfree4goofs.wordpress.com and will change the name from Blog Schmog to Gluten Free 4 Goofs to reflect the food emphasis. Blog Schmog is moving to www.blogschmogme.wordpress.com and we will continue there where I am leaving off here with pictures, stories, gardening, occasional crafting, homeschooling and my journey of faith. My passion is in encouraging others to follow Christ while looking on the bright side of life. And when we don’t feel the warmth of the Son because circumstances cloud our perspective, I hope to seek together the promises in God’s word until he has made his glory known. In short I am on a joy journey and hope you will find nuggets that will give you hope and peace through our Abba Father. We also have joy with our troubles because we know that these troubles produce patience. And patience produces character and character produces hope. And this hope will never disappoint us because God has poured out his love to fill our hearts. He gave us his love through the holy spirit whom God has given to us. Thanks are due my little sis Callie for helping me to get over my conspiracy notions and just blog what I love! 🙂 I started out thinking no one would read my blog if they didn’t “get” something. I also am strange about who might read so if you are a crabby person, don’t give me grief, I might self destruct! Lol! I’m totally kidding, I’m not that easily offended. Actually now that I think about it that is outrgeously wierd. I want to draw readers by providing recipes “a service” but I don’t want people to read? What am I duel enrolled in the oddity club? I was thinking about that verse and our discussions on names and I had an epiphany…. what do God’s names mean and what are they all? So I went on a little hunt. Do you know that our English translation of the Bible is quite limited in understanding of His names. What I mean is that God’s names are so deep and rich yet in our language there is no comparrison to the original Hebrew. Where we use “Lord” there are many many different versions of the name Jehovah (YHWH or simply the 4 letters) which is God’s covenant name or the name He promised. It means that he is the God who continually reveals himself to us. Add it to another name and it literally means he will reveal himself to be as such…. Example; there is Jehovah Raah, which means shepherd, Jehovah Nissi meaning banner or refuge and carries with it a hope that can’t be understood in just one word of the English language. Since Jehovah preceeds each of the names they literally mean, God who reveals himself to be our shepherd, or the God who will show us He is our hope! I’m not doing all the work for you! 🙂 Find out for yourself who God want’s to reveal that He is for you today! Here are a couple few 🙂 websites I found to help you study. I have very little to say about this book but freakin’ awesome and INSANE pretty much sums it up. 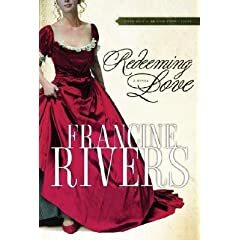 You must know that I hate modern romance books but Redeeming Love by Francine Rivers (an allegory of the book of Hosea) ROCKED MY WORLD! It was loaned to me and I opened it reluctantly but finished it in 3 sittings …and I bought my own copy AFTER reading it! Among my favorite authors, C.S. Lewis and Frank Peretti, Francine Rivers finds good company! It wasn’t even Sunday and I got that feeling in my stomach that happens when you know you are supposed to go up during the altar call. The very same butterflies that urge you to speak out on something important. The unrest that does not settle until you take action. I’m sure you’ve felt the same feeling in one situation or another. But this was the middle of the week. No pastor preaching, nobody challenging my ideals just me driving my car down the road in peace and quiet! Maybe that was the trouble, I’m usually unable to think, let alone pray with my Thinglets poking each other and Pee Wee squealing along with them, my radio blaring to try to drowned out the noise. I knew what it meant. We have a new neighbor in the valley whose house I pass each time I go to town. The family had moved into the single level home six months after the man of the house had suffered a major frontal lobe stroke that put him in a nursing home and made it unable for him to return to their multi level house only a few miles away. Matt and I had stopped by one day and offered our assistance when we saw them moving in. Jane told us the whole story about her husbands stroke and how he was unable to return home to her and the kids until they moved into a house that was better suited to a wheelchair. When we left I couldn’t stop thinking about how I could serve them better. What could I do to help out? 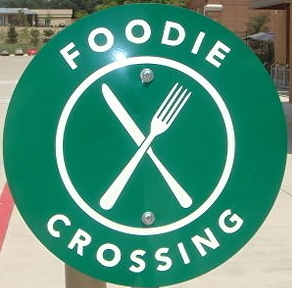 Drop off a meal? Ugh! No offense to any kind soul who serves meals in love but I always cringe at the Christian cliche, “Just serve them a meal!” Although this common practice is how I was introduced to one of my favorite meals to date (so I had better not frown too obviously) it’s just not my cup of soup. I could babysit the kids but anyone who knows me IRL knows that I am not the gal for that job! While I love my kids and have an absolute blast with each and every one of them I’m not the little kid type. Please send me all your teenagers but not your babies! Only one of Jane’s children would fit my category so I didn’t think that would be my job either. Have you ever asked a question and promptly found you regret the resulting answer? I did get a clear answer. Not in the form of actual words but a vivid and real epiphany complete with the thought process behind it, none of which I came up with on my own. For months the Lord has been preparing me to stop and present His harebrained plan of which I am supposed to happily facilitate. I’ve prayed many times since then, ” let me know when it is time Lord,” and yet even when he made it distinctly evident, I didn’t want to go through with it. Imagine an intelligent and mature man who had spent a lifetime pursuing a successful career as a doctor, a family practitioner. He has a beautiful wife many years younger than himself, loving and devoted to him, his three darling children and his time consuming job and passion. They live in a grand custom home on a private lake and lead a life of ease. The family entertains many friends and attends church every holiday. They are the ideal American family. Now imagine you are that man and one night after you lay your head to rest you awake to the bright lights of the ER. The smells and sounds as familiar as your jobplace. I thought about these things and I imagined myself in Dr. Smith’s position. I feared the inability to move myself, to express myself, to learn. When I climbed into his shoes I was terrified and lonely. It’s been a year since his stroke but mobility has not returned, speech continues to allude him. People come to the new house to wish him speedy recovery but most of them don’t know what to say, they talk to him like a child. He can’t lift his hand to shake theirs, he can not assure them he is still as sharp as ever in thought. He can only sit alone with his thoughts hoping to either get well or die. If I were in his shoes I can only imagine the struggle I would have pondering the apparent either/or. Armed with compassion I would not have mustered on my own and the harebrained plan that made me blush each time I explained it to those who were praying, I drove up the driveway to the new house and parked reluctantly at the barn. I was really hoping this was another practice run since I’d parked there once before (another time when the butterflies made me do it) only to find that Jane was not home. This time she slipped out the back door almost immediately and strode confidently toward my Suburban. A lump formed in my throat. I conjured up a front for my visit and began to converse about our kids, 4-H, the Mariners (not really) until finally the swirling, fluttering, shaky feeling could no longer be ignored. Before blurting out the whole plan I had thoroughly convinced myself of the stupidity of reading to an intelligent man, like I was Mr Rogers. The Lord told me clearly to read to a scholarly doctor who despite his medical condition I was convinced could certainly read on his own. After I had settled my fluttering friends, I confided in Jane as to how stupid I felt for even suggesting the idea. The only read aloud forums I would let myself imagine were juvenile gatherings; the library story hour, Saturday nights as a kid listing to my dad read “Little House on the Prairie” and visions of my own children nestled around reading “The Indian in the Cupboard.” What in the world would a full grown man think of me READING to him. “I’m sure he can read on his own, maybe he would prefer to borrow my book!” I explained. The stroke had been severe enough that even a year later the doctor is still unable to sit fully on his own or steady his hands for anything other than a squeeze or a meager wave. His speech is nearly non existent and if he stands at all it is only with the help of a strong adult. Most of the time she said he doesn’t even lift his head to watch the TV. “He just listens,” she assumed aloud. 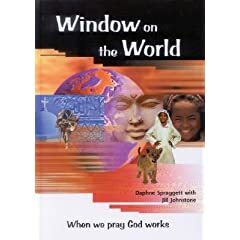 At the mention of faith (a word I had used hoping to avoid the subject of Jesus all together) a whole new conversation emerged and I spent the next hour sharing a spiritual connection with Jane. I learned that she is a believer herself and concerned about her husbands salvation. Before the stroke, he had been successful and preoccupied, not the one to persue Christian gatherings but never in the way of her endeavor to educate the children on “religious” matters. She told me about how more and more people have been pursuing him and telling him that Christ wants to be a part of his life. She told me, with an embarrased but mischievous glint in her eye that she had been reading her Bible to him and dragging him out to church every Sunday. As she described it, they had recently had a discussion where she told him that he needed to give his burdens to the Lord and allow Christ into his life. Things that day had been really bad, he was weak and unhelpful when she tried to get him up, she had struggled to lift while he resisted and in the end he had fallen. She knew that her prayers could only go so far since the Lord will not make a person believe so she urged him to pray and ask God for assistance. The next day his strength was back and his face a little less ashen. The Lord hears and the doctor is beginning to ask! There was an urgency in Jane’s mind in regard to her husband knowing the Lord’s healing. We talked about the possibility of the Great Physician bringing total healing and she insisted it won’t happen until Dr. Smith allows it. I invited them to a bible study at our house and she said they would be sure to come. Through obedience to the Lord, I have made a new friend, been given a new prayer, and am a participant in the healing process of the doctor in heart and health! I am confident this won’t be the end of the story.